The word “love” acquired a different meaning in my life when I became a mother. It was love at first sight when the doctor gave “him” to me. I had waited 9 long months to see him after all! Arguably, unconditional love is something only a parent can feel for one’s child. As a new mother, I’m also better able to appreciate and understand the love and sacrifice of my parents towards my siblings and me. From the time I realized that there was a special someone growing in my womb, I became even more conscious of what went inside my stomach. The first trimester was terrible and I could not eat most foods that I loved. We could never imagine that I would abhor my all time favourite paneer and even the slightest aroma of fragrant ghee could send me into an extreme trip of nausea. For nearly 2 months I did not even step inside my kitchen! I started to feel better once I completed 3 months and after I stepped into the 20th week of pregnancy, it was a different story altogether. I could start eating and relish all my favourite foods once again. I even started craving sweets like never before. Ro’s constant attention to my needs and my mother’s frequent parcels ensured that I did not miss a single food that I craved. And then there were the surprise packages that made their way into my home. 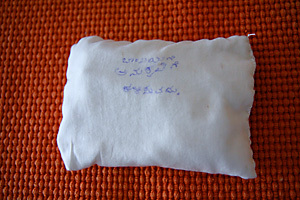 One day it was the courier of perfect chaklis (a savoury snack made with rice flour and spices) made by the 82 year old sister of my grandfather and another day it was special Ayurvedic herbs, devadaru, red sandalwood and jyeshtamadhu lovingly hand sewn with cotton to protect them from dust and moisture, with a beautiful poignant letter and a promise that it was good for me and good for my baby, an age old family recipe, sent by my 83 year old paternal grandmother. And how can I forget the parcel of white pumpkin barfi made specially for me by my maternal aunt Rekha with the message that it was good for pitta (heat) associated with pregnancy and the Kai Holiges (coconut pancakes) sent by my aunt Indira all the way from my hometown, Siddapur. And the couriers sent by my mother-in-law whenever I remembered the plum cake from the temple or the sohanpapdi from K.C Das Bangalore and my favourite amla chutney made by her. Those trips to my favourite restaurants and how my favourite chefs especially chef Sharief from Dum Pukth Restaurant, ITC Grand Maratha Sheraton made me feel so special by covering every inch of our table space with delicacies until I screamed “I can’t eat more!” It was a truly special time and I could go on and on about how my people indulged me and made me feel so very special. Although I digged into my favorites, rasgullas, ice cream and gelatos, cakes and pastries I never lost sight of my pregnancy diet. Milk with turmeric and saffron, almonds, soaked and peeled, greens, fresh vegetables and fruits, almonds and munakka (dry grapes) and my grandmother’s ayurvedic medicine for pregnancy, devadaru, red sandalwood and jyeshtamadhu ground in the said proportions for ½ hour everyday starting from the 4 month until the day I went into labour are a testimony to this. Six months after my baby was born came the question of what to feed him. When Ro asked me “Why don’t you try the baby foods available in the markets?” I said to him “ When I make food for my baby at home, it is made with love, keeping in mind his specific tastes and special requirements. “How can any mass manufactured product cater to the individual needs of our baby?” I asked in return. Ofcourse it is time consuming, but I'm one of those people who like to make time especially when it comes to making and eating fresh food. I’m so happy when so many new mothers I meet feel the same. The process of sprouting grains and powdering them is an age old tradition in India. People use different kinds of grains to prepare food for their babies. According to Ayurveda, Wheat is supposed to be heating to the body, Finger Millet is considered to be cooling to the body and Rice is neutral. This recipe was given to me by my relative Shubha kaku and is perfectly balancing to the body and works best for my baby. The recipes given below require sprouting the grains before grinding them into a powder. 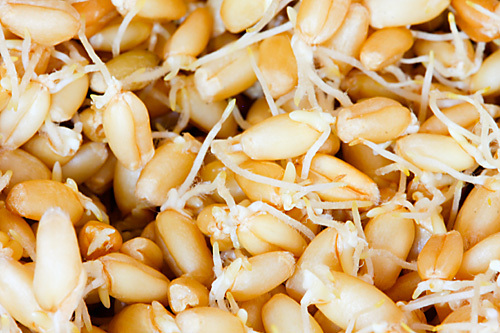 Sprouting is known to increase life-sustaining properties and neutralize phytic acid, which blocks the absorption of many important nutrients. 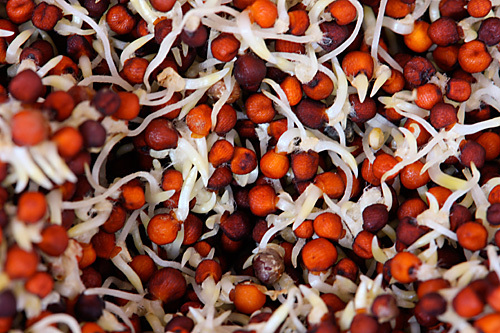 Read more about the benefits of sprouting grains here and here. Wash and soak the finger millet, rice and wheat in separate containers, overnight or for 6 to 8 hours.Discard the water and place the grains in separate muslin cloths or cheesecloth. Tie the cloth to any horizontal surface and allow the grains to sprout. Keep the surface of the cloth moist by sprinkling water. Don’t allow the cloth to go dry. The sprouting can take about 2 days when the temperature is approximately 25 degrees Celsius. Once the grains sprout spread them over a clean cloth separately and cover them with another cloth. Allow the grains to dry this way for about 4 to 6 hours. In a thick, heavy bottomed utensil, preferably a wok or kadhai dry roast the grains on a very low flame until they are completely dry and have a lovely toasted fragrance. The best way to test is when the grains break easily when crushed. This step is a bit crucial since over toasting the grains can burn them easily, increasing the carbon content which is not good for the digestion of your baby. Allow the toasted grains to cool well and grind them to a fine powder in a mixer, grinder or grain mill. Pass the ground powder through a fine sieve. This separates the husk and other particles, which are not easy for your baby to digest. 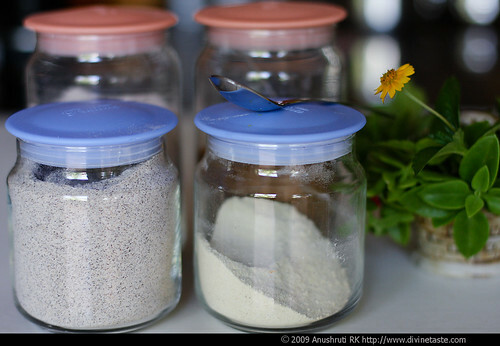 Mix all the ground grains together and store in an airtight container. Preferably use in a month’s time. You can also roast the wheat and finger millet for 30 to 35 minutes at 160C/325F preheated oven. Rice takes about 20 to 25 minutes to get roasted. I make large batches of this taking 500g of each grain and store it in the refrigerator. In a bowl assemble the malt, jaggery and the other optional ingredients and mix with 2 tbsp milk to form a smooth paste. Pour in the remaining milk and cook over a medium flame until the milk comes to a boil. Cool and serve warm. ·Like I said above, you can use different grains for sprouting. Try using Whole Moong Dal or Buckwheat for example to make it gluten free. ·I use semi-polished rice. You can use unpolished rice if that suits your baby. ·You can add mashed fruits of your choice to the above recipe to make it more nutritious and it would also be a welcome change to most babies. ·If your pediatrician allows it, then add a pinch of salt, water instead of milk and finely grated vegetables of your choice to make a soup. This would also make it vegan. ·Ginger powder is supposed to aid digestion and prevent colds. 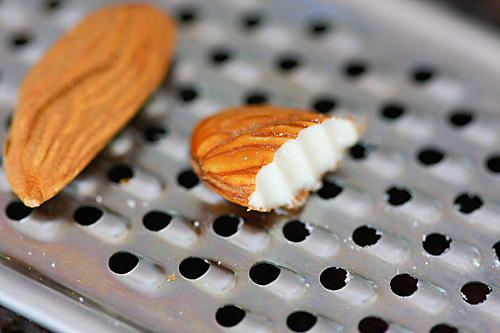 ·Date Syrup and grated almonds are supposed to be rich in natural vitamins and minerals. I would rather trust nature than a chemist to supply my baby’s vitamins. 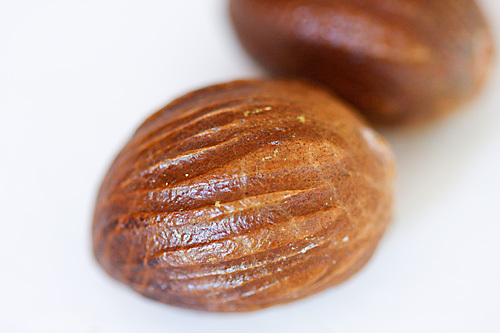 ·A pinch of nutmeg powder promotes sound sleep. ·You can vary the thickness or the consistency by adding more or less of the malt powder. ·It is best to use organic grains for the preparation of this malt powder. This recipe was given to me by my friend Shweta Joshi whose 1 year old Asmi loves it from the time she was 6 months old. Wash and soak the rice and dals in water, in separate containers for a couple of hours. Discard the water and spread them over a clean cloth separately and cover them with another cloth. Allow them to dry this way for 2 to 3 hours. In a heavy bottomed wok or kadhai place cumin seeds and roast on a low flame, about 2 minutes. Remove the seeds and place them in a separate container and allow them to cool. Now put in the rice and roast until completely dry and have a lovely toasted fragrance. The best way to test is when the grains break easily when crushed. Follow the same procedure for the dals. Once the grains cool, powder them in a mixer, grinder or grain mill with the cumin seeds. Take 1 tbsp of the ground powder and mix it with ¾ cup of water. You can add a pinch of salt to taste and turmeric to this mixture.Cook over a medium flame and bring to a boil. Sir in ½ a tsp of ghee and serve luke warm. ·You can add cooked, mashed or grated vegetables to this soup. ·Adjust the consistency of the soup to your liking by increasing or decreasing the ground powder. I thoroughlly enjoyed this post as most of the lines were exactly felt by me too…..I hve just started home made ragi porridge for my 4month old lil one. The process is so time consuming yet it feels soo gud to see her have it with a smile The process includes sprouting the ragi a day before, grinding it to take the milk extract from it then leave it to dry and then add milk to make the porridge. My mother feels when its made instantly its fresh so she does the process daily.But the powdered form is very handy when we are outside home….Sure gona try ur baby malt food as it sounds nutritious! What a lucky baby. It looks like your food is better than anything that could come out of a jar! Best agidhe….Ishtu kashta pattu madidhaku sarthaka! Thana thana amela rohit bala lucky…. Hey Anu, I've only just discovered your website and have spent a very enjoyable half hour going through it. It's lovely to see food bloggers in India, I hope to join your league some day. I intend to be a frequent visitor. I am so glad you are making time to give your son home made food. To me this is the best possible start to life. I did the same (although I did not grind the grains, which is new to me), I prepared all the combinations myself and even got a book from the library about how foods encourage and improve the brain. Nourishment for the body and soul, good luck 🙂 If there are any ideas you want then let me know I will be happy to share with you. Sharmilee: Its nice to hear from you about your ragi preparation. Kiran: I would love to hear your ideas. You are such a nice mother! The pains you've taken to dryu and process the baby food – Hari will read this post one day and realise how lucky he is! I love the food by Chef Shareef – I'd attended a cooking demo there a few years ago – I make the biryani using his recipe. You surely got very pampered! A sense of assurance… I dont have to do any of this and yet this will be made for my sister's niece/ nephew. The gifts of life! I love everything about your blog. The layout, the recipes, photography…it's all executed so beautifully. My mom, too, made baby food for me 20 odd years ago. It caused such a scandal back then because everyone believed that the stuff in boxes was better than natural home-made food. Besides being healthy, the food also helped cultivate my palette from a very early age. Chaitali: Thank you for all your comments. It is words from readers like you that put a smile on my face and make my day. The baby malt powder recipe is wonderful, unfortunately I am unable to get ragi in perth australia. So can I replace moong dhal instead ragi and is it the wheat that gives the malt taste. Also is Finger millet same as millet. Anjali: It is a wonderful food for babies! Yes it is the toasted wheat which gives the malt flavour. Finger millet is Ragi. Thanks for such great information! I learned about ayurveda in my quest to heal my son from colitis. Kitcheri (kitchadi? ), ghee and all those medicinal spices literally healed his gut. I now have a new baby and am introducing new foods. I soaked, sprouted, dried, toasted and then attempted to grind mung beans but it came out all soggy, even after hours of drying. Should I have used green lentils instead? Thanks for the recipes! Rachel: I'm glad this information was of use to you. The ayurvedic way of eating best suits a human being. It is difficult to dry mung beans. I have never tried using green lentils too. I just make this recipe with whole wheat grains, rice and finger millet and I find that this suits my baby best besides being tasty. I try to incprporate lentils and dals in other meals of my baby to take care of the protein requirements. I came across your website when I was looking for egg less cake recipes and I was all excited. First off the way you narrate the cooking process is amazing ,it is truly inspiring. Your presentation is like unveiling an artwork .Also do you mind elaborating the ayurvedic medicine recipe that you mentioned. Samata: Thank you for your wonderful words. I will mail you the recipe if you are interested. Hey Anu ,I will be more than delighted if you can mail me the recipe. Wow Anu…I was searching for some homemade baby food recipes.These recipes are just wonderful…I am sure my baby will get the best nourishment from this.Thanks a million! If you dont mind, can you please post the Ayurvedic herbs you had during your pregnancy and what should be and shouldn't be eaten in those trimesters. Anu – I stumbled on to your website when i was searching for how to make solid foods that are ayurvedically recommended for baby. My baby son is now 6 months old and I'm excited to try the recipe you have mentioned above. Can i use an oven to dry the grains instead of on the stovetop? If yes, would you be able to recommend what temperature and for how long? Also I'm also interested in the ayurvedic herbs recipe you mentioned – would be great if you can send that to me – thanks! for a good recipie. is there any recipie related to kids plzz send to me. Vijji: Thank you for your mail. This is great food for your baby. You dont have to wait till you get to India and can prepare it where ever you are. I will post more recipes for baby food here shortly. Good luck with your baby. This page was just what I was looking for! I'm teaching this series on Evolutionary Childbearing, incorporating practices from Ayurvedic wisdom tradition as applied to our modern lives. I've never run into such a concise crossover between raw foods and ayurveda for babies – this makes perfect sense. Thank you for the beauty and wisdom you bring to a webpage. I'd love to collaborate! Cate: Its so wonderful to meet people like you through this space. Thank you for your wonderful words. I was surfing and came across your blog. Very nice recipes. I want to comment specially for the malt recipe. This is very common in maharastra and karnataka region of India. I also have a kid and i made the malt with mixture of ragi, moong, wheat, rice, roasted chana dal. But one thing should be taken care is the ratio of cereals and pulses. As complete protein can be obtained by equal ratio only. As a baby food, it can be prepared with water, salt, cumin powder and yougurt. As some child like mine never liked sweet taste. Other than the baby food, it can be used for preparation of parathas and rotis. As my 1 year old child doesn't like semisolid form so i use to have 50% of its ratio to wheat flour to make rotis or parathas for him. Liked your other recipes very much…i became fan of your egg less cake..
Krishna Vyas: Thank you for your comment. Chana dal (bengal gram) is considered heavy for digestion for very young babies especially below 1 year. As you rightly mentioned lot of people use whole green moong dal as well. I have included an easy to do recipe as using whole moong would involve removing the skin, etc which is a tedious procedure. Dal or lentils are a great source of usable protein when mixed with the right carbohydrates. Milk, yogurt also have protein and when mixed with this cereal, it becomes nutritious. However it becomes important to introduce dal in other meals as this recipe does not contain dal. However this is a very tasy, nutritious and comparably easy to make recipe. very nice post. I wanted to check with you what is the semi ploished ric you used is it the brown one we get in south india or basmati rice? In ayurved it is best to use basmati rice. My son has recently developed some eczema patches so want to know I I can give him basmati rice or plain or brown rice! Also please share some more babyfood recipes it would be very helpfl to me. You are most welcome Pradnya. Yes, basamati rice is considered to be the best. I use unpolished basmati rice here as it is more nutritious. But while making other rice preparations, I use regular basmati or other white rice. Will try and post more baby food recipes. All the best! hi anu….tis is my 1st visit n tis is amazing…i feel like hearing my granny's experience….wow..g8…. iam too late 2 read tis but i enjoyed thoroughly as if iam a new mother…it exited me so much that i referred this post 2 my friend who's expecting ….god bless..
Meena: Thank you for your feedback. Hi, I stumbled upon your blog while surfing for baby food recipies , n this is the best thing I could come across.. I have been following this n making healthy food for my now 9 month baby. I also add some other ingredients, and would like your feed back please,, as to if I am doing th right thing. I also add a date n 1 banana to the above. Taruna: I think you are doing a great job! If this suits your baby then it is fine! I usually omit sprouted green moon in this porridge and give it to my baby in other forms. The one tip I would like to share with you is don't add the banana when your baby is suffering from a cold or if it is very cold outside. Hope this helps! i cannot wait to feed this wonderful stuff to my cuttie pie. thanks a lot for this recipe. i am treasuring it. I have a 5 month old baby and I came across your blog while looking for homemade baby foods. You malt recipe looks very well-balanced for a baby starting semi-solids. However, I have one question, wouldnt roasting the sprouts reduce their 'nutritiousness', like heat breaking down any nutrients, as opposed to having them raw? There are so many like-minded comments here, I think I will definitely get an answer to my query. Smriti: The roasting enhances the flavour and also makes it easily digestible to the baby. Babies can't digest it raw. Love this post!!! I google-ing for some homemade powders to prepare porridge for my DS and I hit upon this post. Thanks for the wonderful n easy recipes. Thanks a lot dear, I want to try these out as my baby is 8 months now and I have not started him on any of the grains. i have a 8 month old son… i have been trying diff foods for him since he was 6 months.. i sprouted ragi and moong dal and powdered fine.. but it never thickens to make a porridge… it remains watery after heating in sim for around 15 mins also. if it comes properly, then i will try sprouting other cereals and pulses for him.. pls suggest how to make the porridge thick.. and since none of my family members have given sprouted grain porridge to any babies in my family, i want a list of combination of cereals and pulses that can be sprouted and given to my son.. would be very thankful if u can take some time to reply me..
Saranya: Whole moong is difficult to make into a fine powder at home. 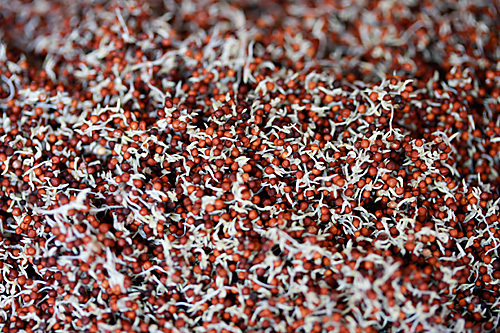 Ragi and wheat (provided it is organic and not genetically modified) are easy to sprout. Rice and rice flour is the best for babies. can i use urad dal powder for my 1-1/2 year old boy?? pushpa: yes you can…try using a little quantity at first and see if he is able to digest. I stick to this recipe and give urad dal in the form of idlis which are easy to digest to my child. I made khichdi powder using your recipe.Only modification I made was to use roasted and powdered flattened rice instead of rice n my 6 month old loved it..keep up the good work.. I am from Rajasthan and my parents or my husband s parents were not aware of ragi …but I had heard about the nutritious value of ragi and decided to give ragi halwa using jaggery and water…only later I was told by a friend not to use ready made ragi flour, instead use Ragi satwa…and make halwa using that in milk…I feel bad that for four months I have been feeding my son Ragi halwa using not so nutritious flour . But now that I am aware of the ragi satwa, I can't find it in market…can u tell me the recipe of that.. I came across ur blog searching for the same and am very glad to read the above mixture recipe…I will surely prepare it…but my son has atopic dermatitis and gets rashes from various things..that's why I had not introduced wheat till now. But using ur mixture, I will introduce him to wheat..hope everything goes right for him. I have been giving him the khichri as in ur second recipe..but don't use toor daal as someone told me to or Dahl causes gas..is it correct? Do tell me how to make ragi satwa if u know? I live in Lithuania. I was looking for homemade baby food recipes for my baby and came across with your site. I have never heard about using sprouting grains for baby feeding, but I do eat sprouts myself and I am so excited to try it for my son when he is six months old. My question is: my son is already 5 months old and he started eating solids like pureed veggies and fruit. Would it be ok to start giving him sprouted wheat food now or should I wait till he is 6 months old. I heard that you cannot give wheat till babies are 6 months because of gluten in wheat. Thank you and God bless you!! Seriously your recipe has been a blessing to me, as i am all alone and no one to guide what to feed my 7 month baby and above all how to make the recipe. I live in Dombivali, mumbai and being surrounded by maharastrian people i heard about nachni amd ragi which i never heard before. Can u help me with more porridge option, as my baby is born before time ie in 8 month and he just 5.57 kg. I want to maitain his weight and to give him the best for his proper growth. I have tried the above one ie rice and dal khicdi, he is trying to evaluate the taste but mostly relying on cerelac. I want to give him the homemade food. Please also let me know which vegetable soups i can give for all the nutritions to cover. God bless u and ur family for the good work u r doing to help mums like us. Nitika:Ragi is very nutritious and is good for growing children and babies as it is easily digestible. But, it can be very cooling to the body so it better not given when the child has cold. Even otherwise it should be given with ginger powder. Don't feel bad about giving plain ragi powder. If you sprout the grains, it is easier to digest. You can prepare ragi flour that way by following the recipe above for ragi powder. Each child is different. You can try introducing wheat to your child by giving him a little by following the above recipe. You can introduce a little dal by giving it to your baby in the day time. Giving a herbal decoction of cumin seeds boiled in water (you can sweeten it if you wish) in the evenings also prevent gas formation. Ilma: sprouting grains is healthy, nutritious and one of the best ways to feed a baby with grains. If you are skeptical, it is better to wait until your child is 6 months old. Some mothers wait till the baby is one year old before introducing wheat. But, sprouting the wheat before making flour with it calms the grains and makes it easy to digest. It also helps to use organic non genetically modified wheat grains. I started giving this porridge to my baby after he was 6 months old. Hi, I must say brilliant!! I love the idea of sprouting, crushing and making your own baby malt powder. I have a question though, for the khichdi, can I use yellow moong daal instead of the green moong daal? I'm planning to make this pretty soon for my 6 month old baby. Samaira: I also use yellow moong dal. You could use the same too. This is great! Thanks so much for taking the effort to detail ou these recipes. I have a 4.5 mnth old daughter and about to start her on solids and this will work just fine. I was wondering what kind of ice do you us…is it normal sona masoori,because frm the picture it looks like brown rice, what type exactly? Nandita: I use organic brown rice for this recipe. Thank you soooo much Anu. Me & my wife very much impressed with the baby food preparations posted by you. We are already using sprouted Ragi malt for our 7 month old baby, but after seeing your recipe we immediately want to prepare food the way you explained. Thank you Anu. Really healthy preperations for our babies.. I have started giving rice-moong dal khichadi to my 5 months old son. Want to start with Ragi now..
Keep posting such healthy receipes.. I stumbled on this when i was looking for ways to make home made baby food, its very informative. I have a 9 month old baby, she likes smooth pasted porridge, i strain the dal kichdi:-((( and give her. Thank you for this, now i can powder and keep the rice-moong dal. Which moong dal is it the whole/without the skin? Thank you for this very nutritious recipe. can you tell me about more recipes which i can give to my 8 mnth old baby? i've given her pureed fruits…but i'd be glad if you could tell me about more cereal recipes. mahi: For babies, the yellow moong dal without skin. Thanks a lot Anu, the receipes you provided were divine for my 6 month baby :-). Devaki: Great to know that. Great help from you for New Mums like me..
Wash off, Dry , Roast and Grind with A little Of Alomnds + Roasted Cumin Seeds. While Preparation, I make it Water or Milk with a little of jaggery/sugar. I ll definitely try your receips given here..
Gayatri: Your recipe sounds yum! Your daughter is a lucky baby to have a mother like you. Lovely post. I am just beginning my new baby good blog and this post is really inspiring. Am blogrolling you at babyfoodcenter.blogspot.in do check it out. Where can i get muslin cloth and nutmeg powder in general? I stay in Bangalore. i want to include moong dal in the malt powdre recipe. will it sprout? thanks for such a wonderful post and a great blog overall…. Can't find date syrup where i stay in Alabama, USA. Please let me know how to make the syrup. What else can i incorporate in my baby's diet to provide ample minerals and multi-vitamins naturally? Excellent write-up…it was really helpful to me as I was looking for home made baby-food and my search ended on this web page. srik: You can get muslin cloth in a cloth shop selling all kinds of cloth or even a baby shop. You can powder jaiphal available in all grocery stores to make your own nutmeg powder. swati: Whole green moong sprouts but I found it difficult to get a smooth powder out of it and stuck to this recipe. You can get date syrup easily. Try looking in indian grocery stores or amazon. Include fresh fruits and lightly cooked vegetables and give freshly prepared food at every meal. Hope this helps. If you have any specific queries ill be happy to help. Rupesh: You can make this with water or cows milk if you are giving it to your child. Mother's milk is not mixed with the malt powder. Thanks a lot for sharing this recipe ,with beautiful pics.I am planning to make this for my 6 month old baby. I have a big doubt ,do I have to sprout rice for this recipie ??? Rupa: The rice does not sprout. i hv a 5 mnth old baby who is exclusively breastfed. i planned to introduce a new one when he completes his 5th month and that too within a week. saw ur recepies. am gonna to try. i hv a question. can i introduce him with ur ragi,rice and wheat receipe or ragi alone or anything else.pls help me in this. fizu: You can try with the ragi, wheat and rice. If you can get organic wheat, it would be great for your baby! Advance Women's Day wishes to u and other women too in ur family. Pls give me a feeding plan/chart of weaning foods to my 6 month old boy as i have to return to my work and it starts around 11a.m n gets over by 6p.m. he has to be left in the creche or his grandma. Awaiting for ur reply and for the previous clarification too. fizu: Try giving him a concoction made with cumin (jeera) and ajwain (carom seeds) by boiling a cup of water with 1/2 tsp each of the seeds, reducing the concoction to 1/2 and giving the baby a few spoons at a time in the evening. This will aid digestion. You can use both the recipes above and slowly introduce pureed fruits (boiled and mashed) like apple, etc. Thank u. Let me try the concotion and also pureeds. if u could pls give me a feeding chart so that i report to my work. fizu: It depends on your timings, the baby's feed timings etc. You can give the finger millet, wheat and rice porridge in the morning and give the rice and dal version for lunch and dinner with some vegetable soup. You could also mix in the vegetables for a one pot meal. Introduce vegetables slowly. Carrot soup is very good for babies. And you could give fruit purees in the evening and slowly introduce things like homemade wholemeal biscuits with milk into the feed. Hope this helps. Thanks a lot for ur instant reply. at present am giving him the ragi malt twice a day and half of an apple(steamed and mashed) in the evening by 3. i feed these alongwith breastfed. nt yet introducd rice-dal version. i would lk to wean breastfeed between 10am and 7pm which is my worktime. Pls help me how to make carrot juice. instead can i give steamed and mashed carrot. And also pls give me the recipe of preparing homemade wholemeal biscuit.if u can pls mail ur reply to my id. if u cant let me visit ur blog. Thank u and God bless u for the service u do for al the new moms. thanks a lot for ur instant reply. at present i give ragi malt twice a day and a half pureed apple by 3 in the evening. in between i breastfeed too. i would lk to wean breastfeed between 10am and 7pm which is my worktime.nt yet introducd rice dal version as i have a doubt in geting red gram. as i reside in south tamilnadu i get only toor dal. are they same. pls clear me this. pls tel me how to make carrot soup and wholemeal biscuits at home. if u could pls mail me . if u cnt let me visit your blog. May god bles u and ur family for the service u do for the new moms. fizu: Steamed and pureed carrot is what I meant! Mung dal or green gram dal is easily available everywhere and should not be a problem. It is the most digestible form of dal and is also a good source of protein. I have a lot of cookie recipes in this section http://www.divinetaste.com/category/recipes/cakes/ You can choose any and replace the plain flour with whole wheat flour. thank u anu for ur help. however i had doubt in getting red gram. red gram and toor dhal- are they same? fizu: yes red gram and toor dal are the same. But I did not give my baby red gram dal until he was a year old. bt in ur recipe for rice dal version says red gram or toor dhal has to b added. wat should i do nw. hw to make rice dal khitchdi without toor dal. thank u and awaiting for ur feed back. wow! a different blog with a variety of recipes. am stunned wen i visited ur blog. is it good for baby? anything else can be given? fizu: Make with only green gram dal or moong dal in the beginning and if your baby tolerates it well then start with red gram dal or toor dal. Both dals are easily available in the market. shasi: I have faith in cows milk, provided it is not adulterated and the cow is kept well. If you can get this assurance from your neighbour, you would be lucky and I don't see any harm in giving it a try. If your baby doesnt tolerate it, then you will have to stop. Great recipe and a very good substitute for ready made baby cereal. please help me with one question, how long does this ground powder last? And what is the best way to preserve it? I was told that we cannot use his powder if it is more then 2 weeks old. thank u anu. let me try with moong dal alone. nw he is 6 +, would u like to suggest me anychange in his feeding pattern. as far as now he is fed with ragi malt twice a day, carrot pureed in the morning and apple in the evening, attimes both mixed together once a day and also breastfed during night time and before i could start for office. I keep it for upto 3 months stored in the refrigerator. fizu: I think you are doing a great job! All the best. thank u anu for ur feedback n wishes. Though my ltl 1 is abt to complete his 7th month in 4-5 days, i still continue the same feeding pattern which i told earlier. Now the elders in my family perturbs me to introduce mashed solid foods like idli and cooked rice. at what age can the solid foods above mentioned be introducd.? Parul: It is better if you find a gas and cook it if the baby is less than a year. "and my grandmother’s ayurvedic medicine for pregnancy, devadaru, red sandalwood and jyeshtamadhu ground in the said proportions for ½ hour everyday starting from the 4 month until the day I went into labour"
nanma: red rice maybe a little difficult to digest at 6 months. However you could use it once your baby is a year old. I am a working mother of a 13 month old. When I reach home, he is hungry and I am too confused what to cook for him. I prefer to give him a dish which has salt in it, so that I can top it up with some ghee. I prepare khichdi with rice or dalia. But, it seems my baby is quite bored with this food. Can you guys suggest some quick/different receipes. Gd evng. Hope u are in fine fettle. my boy has complted his 9th month. He takes ragi malt, mashed veggies and rice with soup and also breastfed. He weighs 8.4 kg. i have a doubt whether this is a normal weight. for these two days he suffers from unexplained fever due UTI. Pls help me in this what can be given to him to be normal. Thank u. You can always prepare the food for your baby, freeze it in small pots. And use one of pots from freezer. In India we don't use frozen foods at all. Frozen foods are as good as fresh foods. Your website which I found while searching for baby foods was a blessing to me. What i liked most is the detailed way in which u hv mentioned all processes and ur way of replying to the comments. Great thing from ur part. Was confused as to what to give my 8 months old baby girl as she was battling with a lot of gas and Indigestion problems right from her 3rd month. I still give her colic aid and neopeptine drops suggested by my doc.unfortunately I gave her red rice kanji as I am a malayali and also mashed and steamed vegetables. She likes idli and has ragi (soaked previous night and mixed in the mixie with lil water and then seived. The watery fluid I'd made into a paste adding more water and I put lil,palm jaggery or powdered sugar cubes. ) Due to her sensitive tummy I hv Ben asked to stick to nestum rice flavour and slowly try rice and rasam and rice n curd. know if rice that is useed shud be white sona masoori rice.And am also a great fan of Ayurvedic way of living and would like to get more insight into the topic.Hope you wild be able to help me in some way. Thanks a lot and very noble that u hv started something like this. Lakshmi: Good digestion is key to good health. And there is a lot we as mothers can do to give our children the path towards good health. Please give your daughter a concoction made with cumin seeds (1 cup water boiled and reduced with 1 tsp jeera, mixed with jaggery or raw sugar). You can give this to her every evening. since she is 8 months, 7 to 8 tsp should be good. Try and avoid packaged foods. You can give her white rice kanji and slowly introduce vegetables and mung dal. Mung dal is easy to digest and very nutritious. Start with a little and gradually increase it. All the best! Anushruti How to sprout rice for the above recipe? 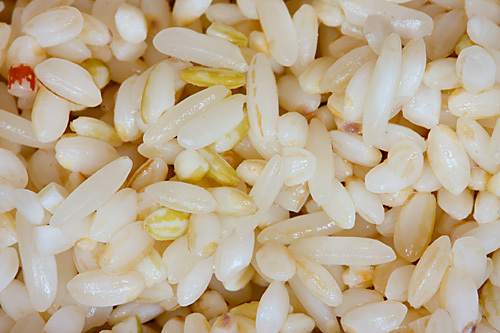 is it okay to use brown rice? Do i need to soak rice and then roast??? My baby is 8 month old can i use brown basmati rice for Malt powder recipe. and can you explain the method to use rice for the recipe as i clearly understood how to use wheat and millet to make the flour. and i have one question what is the difference in wheat and buck wheat can i use it. Please explain how to use rice in this recipe. Thank you so much Anu for this wonderful recipe and all the information you provided. Can this powder help my baby to gain weight. as she weighs only 6.30 kgs only. Connie: Yes you can use brown basmati rice. Just proceed with the recipe as given above. This will be very healthy and nutritious for your baby. Rice doesnt sprout so just soak, dry, roast and powder the rice as given in the recipe. My baby is 8 month old what milk can i use to cook above malt recipe. this is a nice post, tempting to prepare healthy home made baby food. Connie: I gave my baby cow's milk when he was that age. If you are not allowed/giving cow's milk before the age of 1 you can check with your paediatrician and use the milk of your choice. Thanks for this post, very enlightening, I had no idea of the drying procedure after sprouting…I have just been preparing kichadi type purées for my 1 year old, but have noticed she does not always digest this well. Stools are soft and foul smelling. I confess I do not previously soak the yellow mung, could this be why? Generally she tends to kapha imbalance probably due to low agni, so mucuous accumulates in the lungs. Sometimes she has a white coating in the middle of her tongue. How often do babies need mung dal? Every day? Any suggestions for strengthening her digestion? I believe you could do a whole blog just with baby nutrition! Can you direct me to any resources on ayurvedic infant nutrition? I'd be very grateful! sara: I gave mung dal almost twice a day to my baby when he was a year old. You could boil a cup of water with 1 tsp cumin seeds (or 1/2 tsp cumin seeds+ 1/2 tsp carom seeds) and reduce it to half. Mix it with a little jaggery if you wish and give her a few spoons before lunch and dinner. This will help to improve digestion. Hello Anushruti Madam, My self Mrs. Anushka Mane, i just saw your site. It is really wonderful. I was looking for a site that gives me all this information about each ingredients and some delicious recipies. My baby boy is now 6 months old and I’m excited to try the recipe you have mentioned that Nachni Satva and Khichdi. I soak the ragi, wheat and rice for 2 days as you mentioned in your recipe and it is not sprouted as much as i need because here temperature is too cold so is it ok or wait for 1 day more. And i have used ukda rice for soaking for 2 days, but i observed that it is sticky and smelling , i just washed and dry for it now it is not smelling and sticky. So could i used these rice for malt or changed the other rice for soak for one day only. Is it harm to my baby or not, please suggest. Awaiting for your favourable reply.Thanks a lot. Mrs Anushka Ajay Mane- Rice will not sprout. You will have to just soak the rice for a few hours, dry it and then roast and grind as mentioned in the recipe. Ragi and Wheat should sprout in 2 to 3 days if the correct procedure is followed. you need to keep wetting the cloth in which ragi and wheat are tied by sprinkling water. Keep the cloth moist and it will sprout. If the grains have not sprouted after 2 to 3 days and they smell bad, they need to be discarded as it is not good for the baby! Thank you so much for your prompt reply. It has been really helpful to me. fizu: Please consult a physician to cure the infection. Juice of ajwain leaves mixed with honey is good for curing cough and cold in infants. Thanks a lot for these recipes. Being a first time mum I was wondering what to start with solids to my bub! your post was really helpful, My bub is loving to eat these everyday now. Thanks anu for ur rply. He is under treatment. Sowmya: I'm really happy to hear that! When I get feedback like yours, I get a sense of fulfilment out of the fact that the purpose of writing this post is accomplished. fizu: Hope he recovers soon. All the best! fizu- don't worry, at times due to medication, the colour of the stool changes. A pinch of nutmeg and jaggery mixed together are very effective for stomach ailments. Hai anu. Aftr a long i txt u. My boy is 20 mnths old whose head seems to hv temp always. Sugst me with sm hlpful remedies. Thank u. Awaitng for ur rply. shasi: Have you consulted a doctor? What does the doctor say? fizu: Please take him to a doctor. You can also apply coconut oil and give him a 1/2 a cup of decoction (few spoons at a time) made by boiling 1 cup water with 1/2 tsp ajwain or carom seeds and 1/2 tsp cumin seeds and reducing it until it becomes 1/2 a cup. Sweeten it up with some jaggery. But, please take him to a doctor to rule out any serious ailment. fizu- virgin pure coconut oil is very good. But, if it's something serious, please consult a doctor. Hi Anu Great post by you . Thank you for so much information. My Baby is 10 months old. can you please suggest me which fruits & vegetables are good at this age. Can I offer her banana everyday mix in porridge as suggested above. excellent baby food recipes, thanks a lot for sharing these on your website. It sure helps first time mothers like me. I have a question – is it ok to give cow's milk to babies who are less than a year old? If not for cow's milk what other substitutes can be used for this recipe? Hai anu, hapy to c u aftr sm tm. Just read the golden milk receipe. Already gvng to my 2yr and 9 month old boy. Instd of sugar i add honey. Is ths gud for hm. Cn i cntnue gvng dis milk. Ashwini- Giving milk to a baby less than a year old is a personal choice. You can also seek your doctors advice. I gave my baby milk mixed with this powder when I started him on external feeds at 6 months. fizu- give the honey separately, not with the milk. Add sugar (preferably raw) with the milk. Thank u anu. Wat is raw sugar. Is it the jaggery powdder. Vry often he has running nose. Y is it so. Pls help wid som home made tips. How to make thuthuvalai drink. Fizu- Raw sugar is unprocessed or minimally processed sugar. It is different from jaggery powder. The juice of the leaves of ajwain mixed with honey is very good for a running nose. Hey I wanted to ask if I can give malted cereal by mixing it with hot water as we prepare cerelac. Will dat cause any harm to my baby. Is it necessary to cook it on Gaston. Alka- For my baby, I always cooked this into a porridge. If you roast the powder nicely, you can mix it with boiling water too. I havent tried it though. fizu- Please take him to a doctor if the fever persists. Giving the child lukewarm water to drink alongwith light food also helps! hi Anushruti.. when you started ragi mixture for your baby? did u started as first food? mona- I started at 6 months..yes it was one of the first foods I introduced after fruits and rice. hi ,for your six month baby you sieved ragi mixture with normal fine sieve or with a muslin cloth? Kavita- I don't recommend mixing fruits with this porridge. They should be given separately. Go for soft fruits and if your baby is not prone to colds, then banana is ok.
thank you for all your suggestions given in above coments nd they r vey useful. poonam: Thanks for your inputs. Will surely share more ragi recipes.